Operator Pedro Lopez runs a job on one of Saugus Union School District’s four Xerox digital printers. For years, tracking print jobs was an arduous process for Saugus Union School District’s in-plant. Thus began a search for an automated job tracking and billing software — a search that ultimately led the in-plant to EFI’s Digital StoreFront Web-to-print software solution. Today, the process is far smoother, Trock says. The Santa Clarita, Calif.-based in-plant serves 15 school sites in Northern Los Angeles County, producing classroom materials, professional development material for teachers, business cards, booklets, pads and forms, among other items. All of these can be ordered via Digital StoreFront. A single operator, Pedro Lopez, produces them using four Xerox digital printers: a Xerox Color 570 and three Xerox D125 copier/printers. Though Digital StoreFront has certainly simplified the workflow, it wasn’t an immediate success, Trock admits. Despite the rocky start, the EFI team stuck with her, working to fine-tune the system, train employees and work out the kinks as many times as she needed them there for it. Part of the challenge was that everything — from the budgets, to the terminology, to the curriculum — changes every year as the state, local and national laws all change. That requires a system that can be nimble enough to be adjusted on the fly, while the foundation remains the same, so individuals across the district can continue to use it without additional training every year. “It’s a large undertaking every year, that no one thinks of,” says Trock. The system is now running smoothly, and Trock hopes to roll it out to encompass even more district forms and paperwork. To help get all of the office mangers and clerks fully trained and using the system, there is a tech team member in place, trained on the system, with at least one person on-site at each location across the district. “We have to teach them and convince them this is faster than their hard copies. They don’t like to go paperless when they’ve been doing the same things for decades,” says Trock, acknowledging a common frustration among in-plants that have added Web-to-print systems. The district also plans to get access for the teachers, who will then be able to send their forms and materials for printing directly, and all the office manager will need to do is approve it, which they hope will help streamline things a bit more as well. 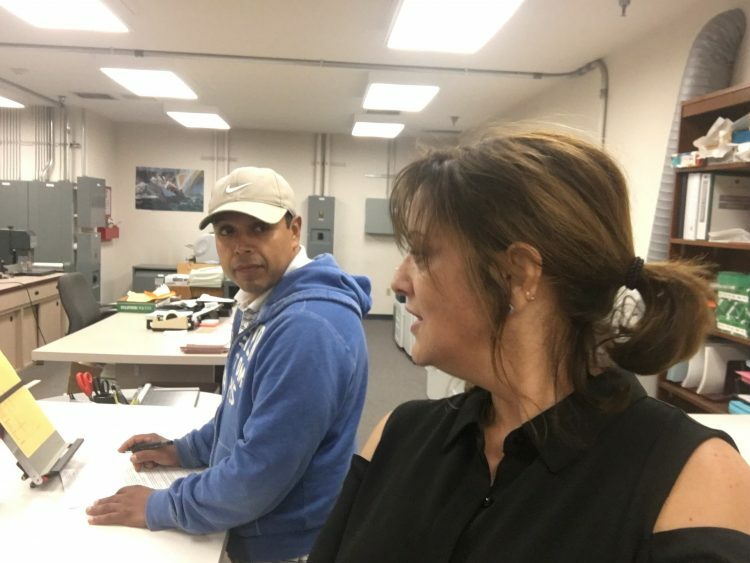 At Saugus Union School District’s in-plant, Operator Pedro Lopez and Renee Trock, executive assistant in Education Services, discuss a job. Since adding Digital StoreFront, Trock now has a full and complete accounting of the print expenditures each year. And as the district rolls out person- and department-specific access codes, she will be able to continue to track the data to an even finer degree in the future. The job ordering process has also become much smoother. Business cards, for example, are now a simple matter. “What used to happen was the sites would call our department and we would have to go manually into a template, input the information, and send that to the printer, which would then have to make sure it lined up correctly on the card stock,” says Trock. “Now the sites order business cards through EFI and it is on our desk. They go straight to the print shop.” The office manager at each of the 15 school sites inputs the information and sends it right to the in-plant. “This has saved us tremendous time and money,” Trock says. At the end of the day, Trock and the Saugus Union School District prove that, despite the challenges of implementing new technology and the process change required to meet objectives, it is critical to find a partner that is focused on the end goal.